Michael Jackson takes centre stage during The New Art Gallery's 10th anniversary birthday festivities. The life-sized bronze statue of The King of Pop has been created by Chinese artist Yang Mian. His sculpture is joined by 50 other works, including 2001 Turner Prize winner Martin Creed's balloon installation. The exhibition - called PARTY! 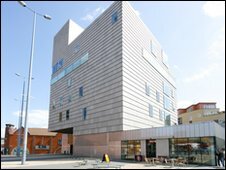 - marks the gallery's 10th birthday and runs until 18 April. Also on show is David Batchelor's Disco Mécanique, a sculpture incorporating brightly coloured mirror balls made from hundreds of pairs of plastic sunglasses. 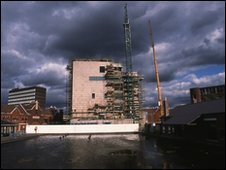 Officially opened in February 2000 to national acclaim, The New Art Gallery was designed by Caruso St John Architects. Clad in terracotta tiles and featuring a distinctive 100ft tower, it was short-listed for the 2000 Sterling Prize for architecture. Since opening, the gallery has been visited by over 1.6 million people - with over 200,000 coming through its doors in 2009. "The New Art Gallery is a real success story," said gallery director Stephen Snoddy. "We've not only succeeded in exhibiting emerging and established artists but we've also maintained our strong links with the people of Walsall. "We pride ourselves on being innovative and challenging but also inclusive and accessible."